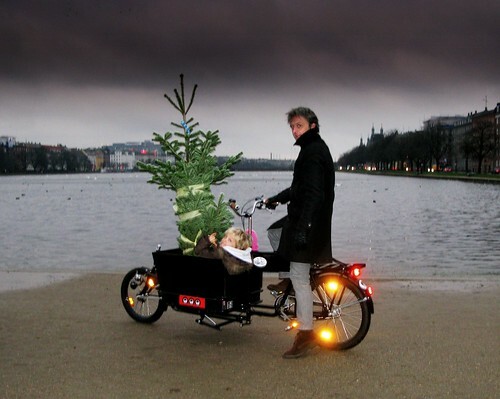 Cycle Chic®: Seasons Greeting from Cycle Chic! Seasons Greeting from Cycle Chic! At the exact time that this post goes live I'll be seated at mother-in-law's amazing yule dinner table. It's a legendary spread. Roast pork and roast duck with potatoes, candied potatoes, red cabbage and gravy, among other things. Afterwards it's rice pudding with an single almond hidden inside. Whoever gets the almond in their portion gets a present. After dinner we decorate the tree and light the candles on it. Then we sing and dance around the tree. 'Dance' is really a funny word to use, but that's what it's called. We hold hands and walk around the tree. The songs are mostly childrens songs for the benefit of the kids. Then... finally... we sit in the living room and open our presents. At some point, Father Christmas comes by, in the form of a friend of ours. He gives presents to the kids. Then yours truly pops down to his house to put on the costume and do the same for their kids. 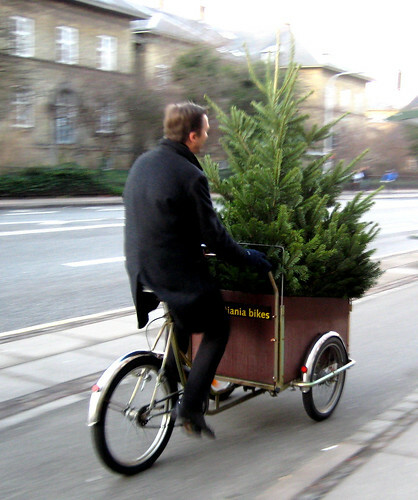 We didn't fancy the idea of getting a christmas tree this year so I'll have to reblog the above, me and the kids heading home with the tree. 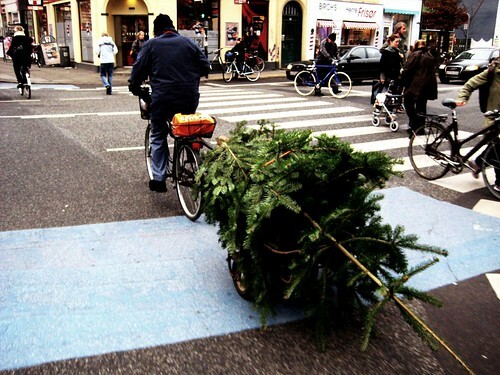 The seasonal celebration is called 'jul' in Denmark, from the Old Norse 'jól'. It lives on in English with 'yule'. Originally a pagan festival celebrated at this time of year, the christian influence highjacked the ceremony but the original name lives on. Kind of like the pagan symbol of fertility for the spring festivals - the hare - who still shows up at easter. December 25 was the first day of the pagan calendar and people used to celebrate all night long to honour the 'divine mothers'. 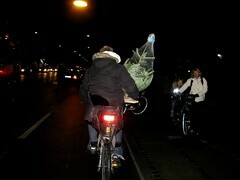 Here's some more photos of bicycles and christmas trees. Cycle Chic wishes you all a very happy season and thanks to all our readers! And a Cool Yule to you and your family, Mikael. Looking forward to another 12 months of inspiration from your blogs - because, boy, do we need inspiration here on the other side of the North Sea. love the carts pulling the tree along. nice to know how one celebrates overseas. Happy wishes to you and yours as well! Just recently discovered your blog and it is like a Christmas present here everyday! Thanks for a gorgeous, informative, fun blog with a big heart for all things to do with natural cycling. Merry Christmas to you and the family, Mikael! Merry Christmas, Mikael! Thanks for another year of my favorite blog! Your Jul sounds just lovely...peace, thanks, and warm wishes. I'm more of a Mayday guy myself; but have a happy. xoxo from Washington, DC. Loyal readers, both. Us pagans celebrate winter solstice here with Christmas being "Santa Clause Day". "Jul" works for me. Have a Merry one. I love your Danish/Old Norse version of Christmas and shall be sharing this with my friends as I love the season, the concept, but I don't do the Jesus aspect of it all. Thank you. And thanks for a wonderful blog, too! Merry Christmas from Los Angeles, Mikael. My wife and I honeymooned in Copenhagen this past summer and the decision was sparked and inspired by reading and gazing at your blogs. Thank you! The kid in the last image is dreaming of a nice mini van from St.Nicholas. Look how he's leaning away from it. How'd you like to scratched in the face by pine boughs for an hour while the sanctimonious 'rent sweats it up the hill, throwing acid on car hoods and yelling obscenities at the bourgeois? Future BMW owner, methinks. lol. amusing and yet unlikely. that's my boy Felix hamming it up with his 'hip hop face' as he calls it. when the bicycle is introduced with the mother's milk, and one lives in a liveable city that embraces the bicycle, BMWs may be in your future, but only in your late 30's when many people acquire automobiles. thank you very much for your excellent blog! We are thinking about a family bike, and while we love the style of the trio we think 2-wheelers seem better for us. 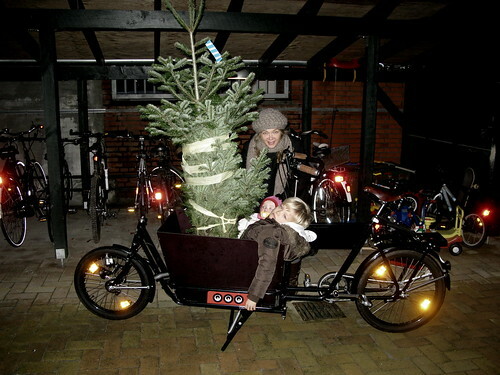 We also looked at workcycles in NL, and they are very good, but we definitely prefer better styling. So here comes the bullitt. The drawback with this bike is the smaller child compartment. How do you cope? And they only have a very basic cover, nothing like the cabriolet style of the trio with windows etc. Do you have a standard child box or something larger, custom made? Our children are 1,3ys and nearly 4 years. We might run into space problems soon. my kids are 2 and 7. it's more of a tight fit than other bikes, but performance-wise and weight-wise I wouldn't trade it. my seven year old can stand up inbetween my legs, holding onto the handlebars - which he loves - if we have groceries. You can get a wider box for the bike like in this photo, which helps. 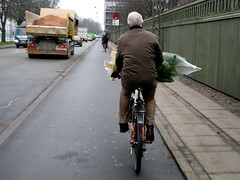 Alternatively, Christiania Bikes now have a two-wheeler now, which you can read about and see here. bigger box - the kids sit on a bench - and quite cool.